Completed cribwall and restored, planted embankment. 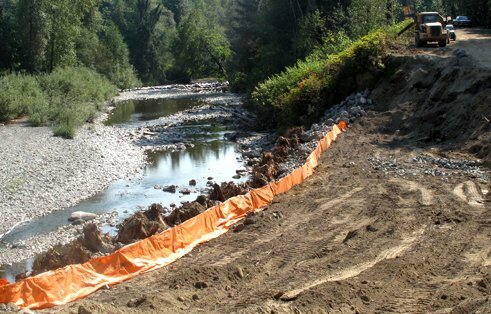 Cribwall, shown during construction, will stabilize a failing section of bank. Placing the soil embankment above the 200-foot-long cribwall. 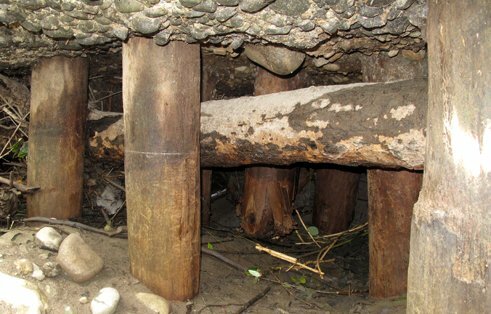 Condition of 100-year-old timber piles before repairs were made. 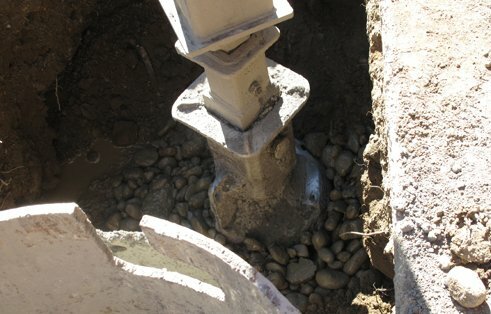 Installing the drilled shafts adjacent to the piers. New bridge platform being launched into position atop restored piers. Rehabilitation of an abandoned rail corridor protects natural resources and created a popular recreational trail. The Centennial Trail stretches more than 25 miles from the City of Snohomish to the Skagit County border in Snohomish County, Washington. The trail lies on what was once the Seattle, Lake Shore and Eastern Railway constructed in the early 1900s, which has since been abandoned. The County purchased the alignment and began redevelopment in 1989 during Washington State’s centennial year. Centennial Trail consists of a 10-foot-wide paved multipurpose trail for bicyclists and pedestrians, along with a parallel six-foot-wide natural surface path for equestrian users. In 1995, GeoEngineers began providing geotechnical recommendations for the first Centennial Trail extension, a 10-mile section from Lake Stevens north to Arlington. This section included a bridge at Lauck Road, crossings at the Main and North Fork of Quilceda Creek and a boardwalk and dock at Lake Cassidy. 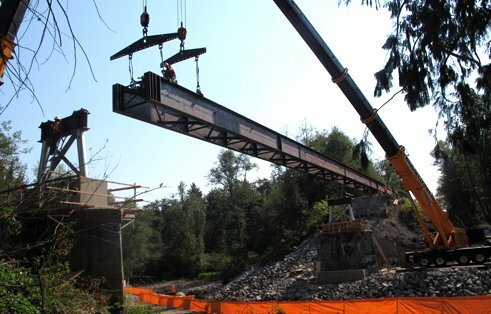 When the County began Phase 2 of the project, a seven-mile extension from Arlington to the Snohomish/Skagit County Line, GeoEngineers contracted to provide a geologic-hazard evaluation and geotechnical engineering services for the trail, including three bridge crossings. This trail extension crosses the Stillaguamish River, a large building-material supplier’s driveway and Pilchuck Creek. Explored subsurface soil and groundwater conditions along the 25-mile trail sections including drilling in difficult access areas near the 100-year-old bridge piers. 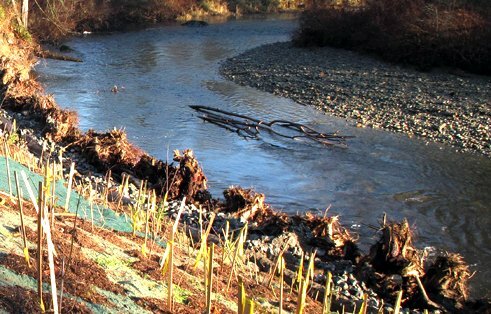 We also provided recommendations for suitable wall types, reinforced slope design and drainage considerations at numerous locations. Completed dynamic PIT (pile integrity testing) of the original timber piles supporting the piers and developed recommendations to restore the foundation. Provided construction monitoring services and observation for, earthwork and subgrade preparation along the trails, reinforced slopes and wall construction, individual pile evaluations and restoration recommendations for the original timber piles beneath the bridge pier, and construction monitoring for driven piles for the bridges, boardwalk and dock projects during Phase I. 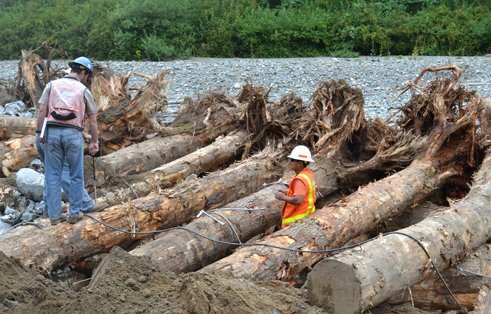 Designed a 200-foot log cribwall to be placed at the toe of an eroding trail section along the Pilchuck Creek during Phase 2. Designed a cribwall structure that was anchored into a bedrock shelf, thereby reducing costs substantially from a typical cribwall design.